Bernice Goatcher married Walter Doyle Guffey. This is her family line. A. E. GOATCHER born in 1855 and died April 24, 1905. He married MARTHA A. WILLIAMS December 21, 1883 in Searcy, Arkansas. She was born in 1868 and died November 06, 1904. Marriage license. i. JOHN MARMADUKE GOATCHER, b. January 30, 1895, Arkansas; d. January 17, 1986, Arkansas. iii. WALTER GOATCHER, m. ETTER BOAZ. iv. DAISY GOATCHER, m. MCCALL. v. TAVA GOATCHER, m. HOBSIN. John Goatcher, Margaret, Opal and Ruby are listed as living in Jackson County, Arkansas on the 1920 census. i. OPAL BERNICE GOATCHER, b. September 04, 1917, Jackson County, Arkansas; m. WALTER DOYLE GUFFEY, October 07, 1935, Jackson County, Arkansas; b. June 04, 1916; d. January 12, 2008.
ii. RUBY NEAL GOATCHER, b. 1920; m. ALBERT RICHARDSON. 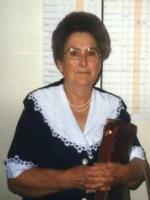 Obituary for BERNICE GOATCHER GUFFEY: Opal Bernice Guffey, 93, of Cash departed this life Wednesday, December 29, 2010. She was a member of Cash Assembly of God Church and preceded in death by her husband of 72 years; Doyle Guffey, parents; John and Elizabeth (Teague) Goatcher, one grandson; Jeff Vickers, one great grandson; Jonathan Tubbs and one sister; Martha (Jackie) Lancaster. She enjoyed sewing, gardening, camping, hunting and loved her family and church family. She is survived by one son; Boyce Guffey (Thelma) of Cash, two daughters; Una Joe Vickers (Darrell) of Newport, Janice Baxter (John) of Cash, one sister; Ruby Neal Richardson of Jonesboro, six grandchildren, eight great grandchildren and seven great great grandchildren. Services will be 2:00 p.m. Monday, January 3, 2010 at Cash Assembly of God Church. Burial will be in Ballews Chapel Cemetery. Visitation will be 5-8 p.m. Sunday, January 2, 2010. Officiating will be Ronie Snow and Carl Neal. LUTHER GOATCHER (A. E.) was born March 10, 1900. He married VELVIE REED BROWN, daughter of JOSEPH LESLIE BROWN (1887-12951) and DONNIE MAE BROWN (1893-1929), on 10 Feb 1934. She was born September 29, 1914 in Tennessee. She died February 14, 12994 in Jefferson County, Missouri. Luther was a good friend of TAYLOR GOODMAN. Taylor and Polly named LUTHER GOODMAN after him. Daddy told me that Luther and a few other men were in a truck on their way home from work. It was really foggy out and they were killed by a freight train when going over the railroad tracks. He died on 3 Jan 1946. He was buried in Ballews Chapel. Brenda and I found an article in the Tuckerman Record of where Luther Goatcher had wrecked Grandpa Taylor's truck in an earlier incident. ii. RUBEN GOATCHER, b. August 03, 1945, Denton Island, Arkansas; d. May 25, 2009, Shelby County, Texas; m. HEVERIN A.. Her birth name was actually VELVIE REED BROWN at birth, sometime after her mother Donnie passed away a teacher she had told her she was spelling her name wrong and that it should be Velva Marie and she stuck with the name. After she died in 1994 according to her will a head stone was placed in DeSoto Missouri but her body was shipped back to Arkansas to be buried next to her first husband Luther Goatcher. Velvie married (2) VERNON EUGENE JERNIGAN on 8 Jul 1950. Vernon was born on 12 Sep 1914. He died on 19 Mar 1979. Velvie married (3) ROBERT GREEN . Robert died in 1955. Velvie also had 2 other children with Vernon. ii. DEBORAH SUE JERNIGAN married (1) STOKES and then (2) GRIGGS. Born Jan. 29, 1953 Died Feb. 15, 1998. Information on VELVIE REED from Find a Grave website.